What do you do if you're a PokÃ©mon addict who's too shy to ask someone out in person? Use a Game Boy game to ask them out for you. The PokÃ©mon games are notorious for being addictive, but they're not exactly known for being a great way to ask someone out. However, a couple of photos that have surfaced show just how effective the original Game Boy versions can be at letting someone know how you feel about them. We've grown really close and I want you to have this. I'm at the Elite Four right now, and I made you a special team to beat them. 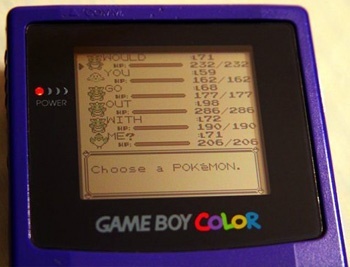 When the game was fired up, the "special" team was arranged so the PokÃ©mon names spelled out "Will you go out with me?" Looking at the levels of these different creatures, there was some serious time and effort put into this date proposal. It's difficult to tell how old this story is, seeing as how this was all done with an old-school Game Boy and an original PokÃ©mon: Red cartridge, but the story's had a surge in popularity across the Web over the past 24 hours. Still, that doesn't make it any less adorable. Or possibly creepy. It's still hard to determine which.